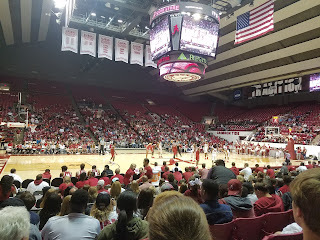 Last night I attended the Tide Tip-Off event promoting the University's basketball teams. This was the third annual edition of the event, and it has grown and improved every year. The players and coaches were set up at tables spread out across the concourse signing autographs prior to the event. 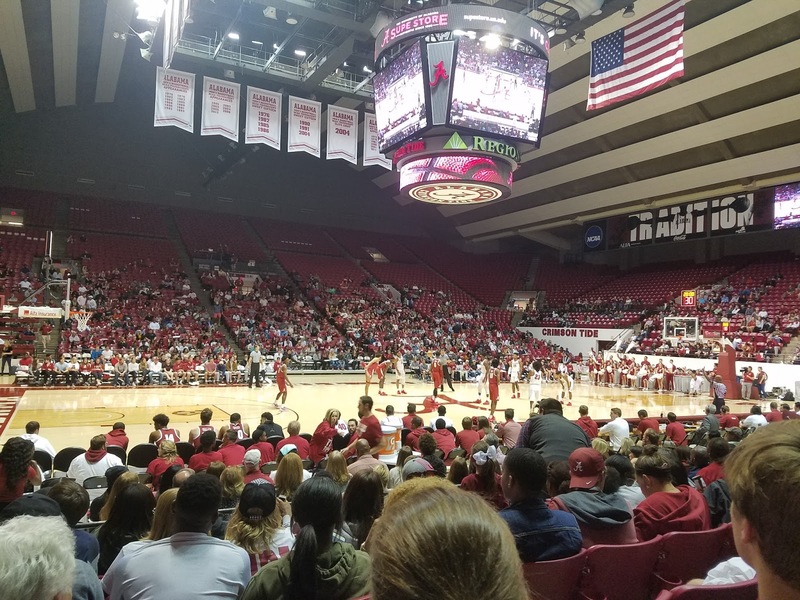 They gave away free T-shirts and posters and had several drawings for other prizes including video game console systems, Fitbits, 50 inch televisions, and an Apple watch, and a couple of guys air-balled half-court shots that could have won them $25,000. The women's team had a 3-point shooting contest with student guests, and the SkySquad Dunk team performed. This event is more catered to the casual or prospective fan, but there are a couple of things worth noting. Coach Johnson addressed the crowd and said there are 3 important numbers to think about tonight, 6,7, and 8. 6- We have sold 6,000 season tickets, supposedly the most we've ever sold. We need everyone to show up plus the students to make it a packed house every night. 7- "There are 7,000 people here tonight." Frankly, I'm not sure where he got that, it looked more like about 4,000 to me, which is still a great crowd for this type of event, on our standards anyway. The White team won 106-103, but it was hard to tell a whole lot by the scrimmage. If you've ever watched an NBA All-star game, that was basically the level of defensive intensity for the first 20 minutes, and the first open 3 was being jacked up at both ends. The last 10 minutes featured a bit of a press and at least a little more effort defensively. -Petty continues to look like the best player on the team. He was draining 3s from all over. -Tevin Mack has a nice shot and a strong presence, he will help us next year. -Norris and Davis were out with injuries. -Sexton...We all know he's the most athletic and by far the quickest player on the court. There is simply no way to stop him from getting to the rim if he wants to, but he's also prone to turnovers, even against a squad that wasn't playing defense. He constantly complained to the officials, which seemed silly to me in a setting like this. If anything, this was the time to try to build some rapport with the zebras. Finally, he had the ball with his team down 3 in the final seconds, and missed a dunk rather than trying to tie the game. I'm trying not to read too much into these things, but based on everything I've seen so far, I have some concerns about him having the proper mentality to reach his full physical capabilities. The event concluded with a slam dunk contest, but I did not stay for that, as it was already 8:30 by that point. While the SkySquad dunk team was very good and entertaining; I would have preferred the team's dunk contest to be in that spot instead, as I think two hours is a bit long for this type of event. At least half the crowd left with me after the scrimmage. 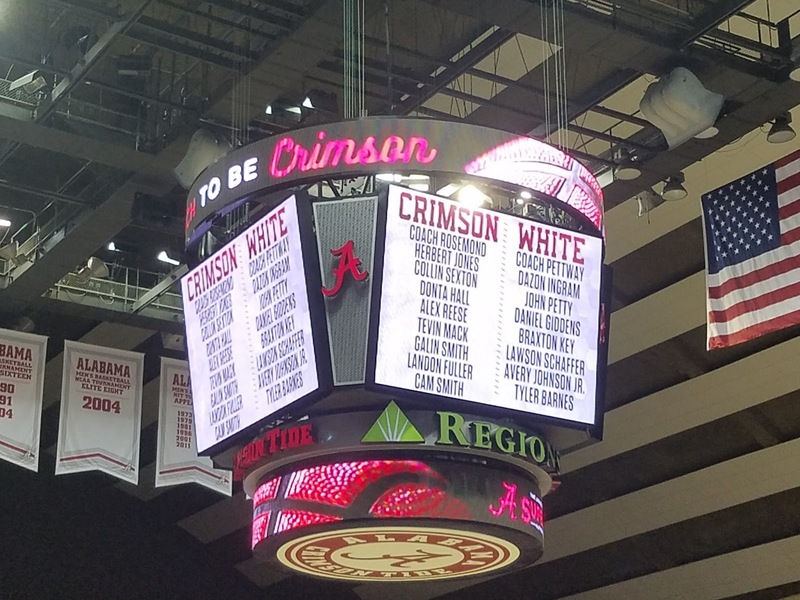 Up next, the exhibition game against UAH on Monday, November 6 at Coleman Coliseum. The game will tip-off at 7pm.